A small, dense object only twelve miles in diameter is responsible for this beautiful X-ray nebula that spans 150 light years. At the center of this image made by NASA's Chandra X-ray Observatory is a very young and powerful pulsar, known as PSR B1509-58, or B1509 for short. 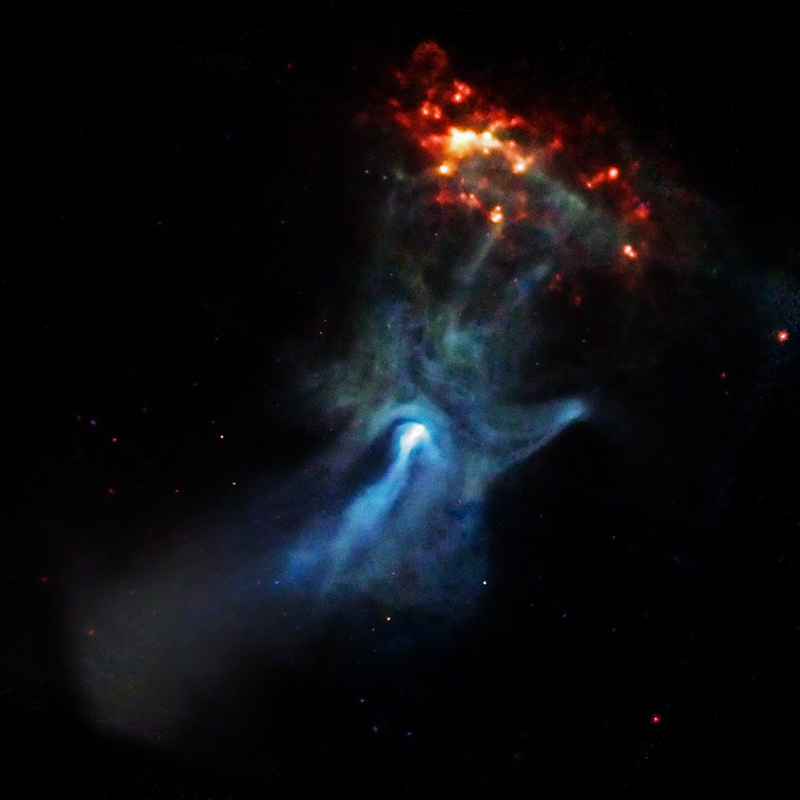 The pulsar is a rapidly spinning neutron star which is spewing energy out into the space around it to create complex and intriguing structures, including one that resembles a large cosmic hand. In this image, the lowest energy X-rays that Chandra detects are colored red, the medium range is green, and the most energetic ones are blue. Astronomers think that B1509 is about 1700 years old as measured in Earth's time-frame (referring to when events are observable at Earth) and is located about 17,000 light years away. Neutron stars are created when massive stars run out of fuel and collapse. B1509 is spinning completely around almost 7 times every second and is releasing energy into its environment at a prodigious rate — presumably because it has an intense magnetic field at its surface, estimated to be 15 trillion times stronger than the Earth's magnetic field. The combination of rapid rotation and ultra-strong magnetic field makes B1509 one of the most powerful electromagnetic generators in the Galaxy. This generator drives an energetic wind of electrons and ions away from the neutron star. As the electrons move through the magnetized nebula, they radiate away their energy and create the elaborate nebula seen by Chandra. In the innermost regions, a faint circle surrounds the pulsar, and marks the spot where the wind is rapidly decelerated by the slowly expanding nebula. In this way, B1509 shares some striking similarities to the famous Crab Nebula. However B1509's nebula is 15 times wider than the Crab's diameter of 10 light years. Finger-like structures extend to the north, apparently energizing knots of material in a neighboring gas cloud known as RCW 89. The transfer of energy from the wind to these knots makes them glow brightly in X-rays (orange and red features to the upper right). The temperature in this region appears to vary in a circular pattern around this ring of emission, suggesting that the pulsar may be precessing like a spinning top and sweeping an energizing beam around the gas in RCW 89. 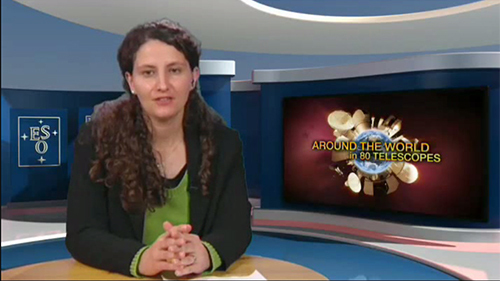 "Around the World in 80 Telescopes" was a unique live 24-hour webcast, following night and day around the globe to some of the most advanced observatories both on and off the planet. 100 Hours of Astronomy was a global astronomy event from 2 to 5 April 2009 and a project of the International Year of Astronomy 2009. 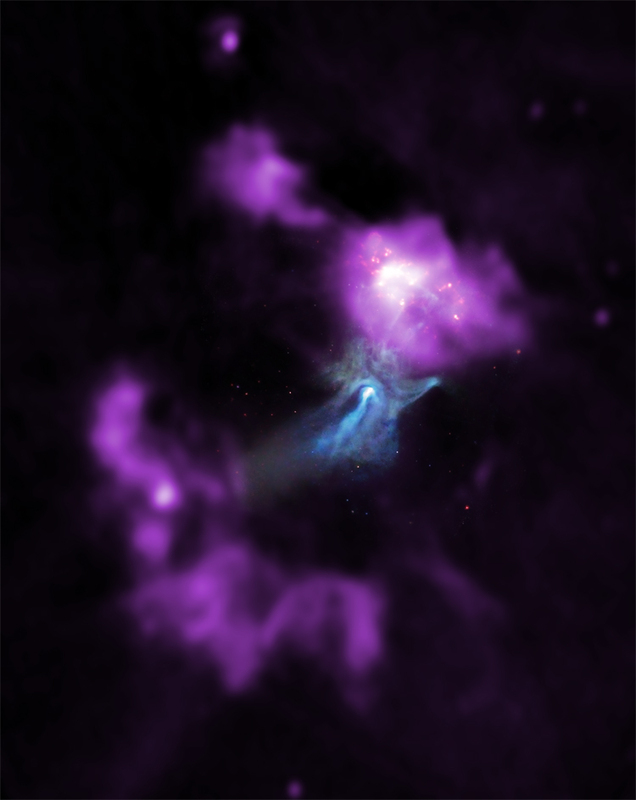 The Chandra X-ray Center released a stunning X-ray image of the young pulsar B1509 during its webcast. Coordinates (J2000) RA 15h 13m 55.52s | Dec -59° 08´ 08.8"